Kings Lynn, the friendliest of all East Anglian towns, is so far away from anywhere else of any size that it has a fierce independence. It is as though it is in Norfolk, but not really of it. The town is in the Yorkshire television area, and this is not unreasonable, since it looks towards Hull and Lincoln as much as it does towards Norwich and Cambridge. 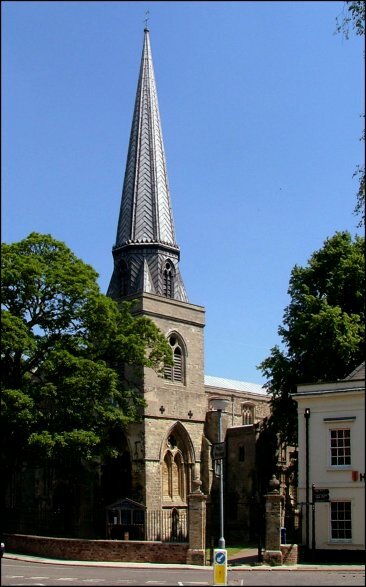 All the northern Fenland comes here on a Saturday to shop, and two of England's biggest churches stand half a mile apart at either end of the main shopping street. 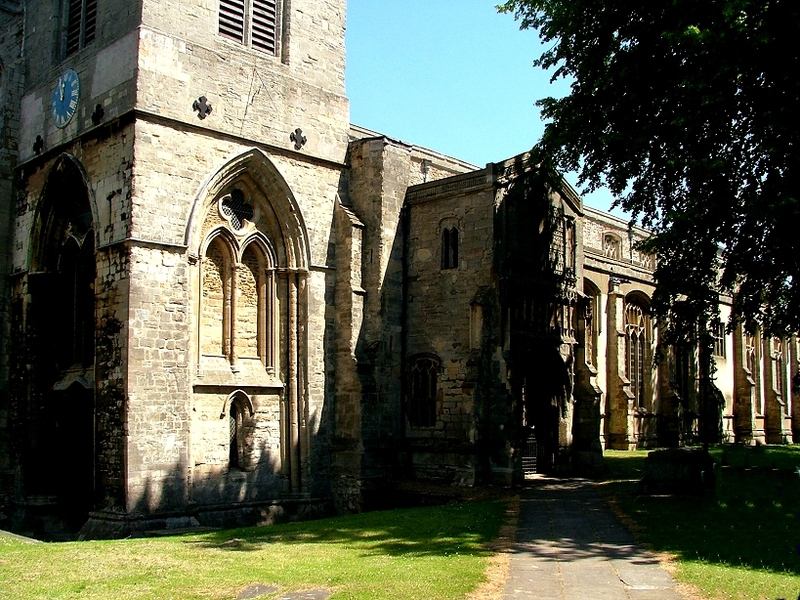 We have already met St Margaret, the southern one, a great cruciform parish church on the Saturday Market, at the heart of the medieval town. Today, St Margaret is surrounded by busy narrow streets, 19th century shop fronts and 20th century flats, a cheerful scruffiness that melts into the haunting Lynn waterfront. 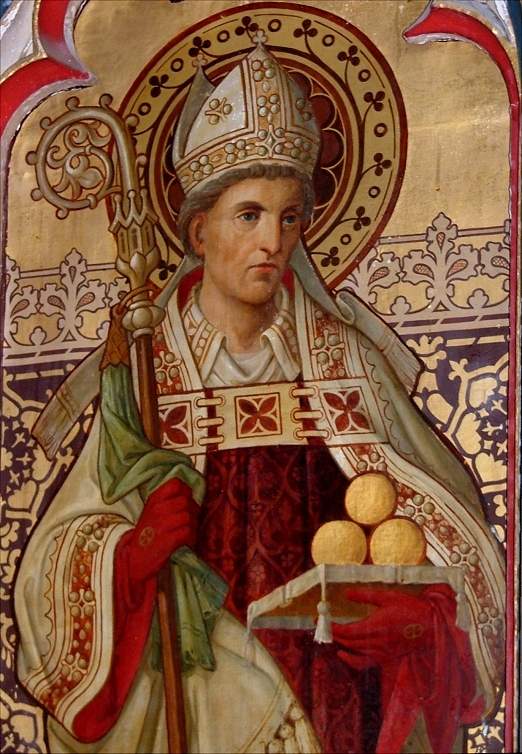 But just off of the Tuesday Market, in the part of town known as the Northend, there is St Nicholas. 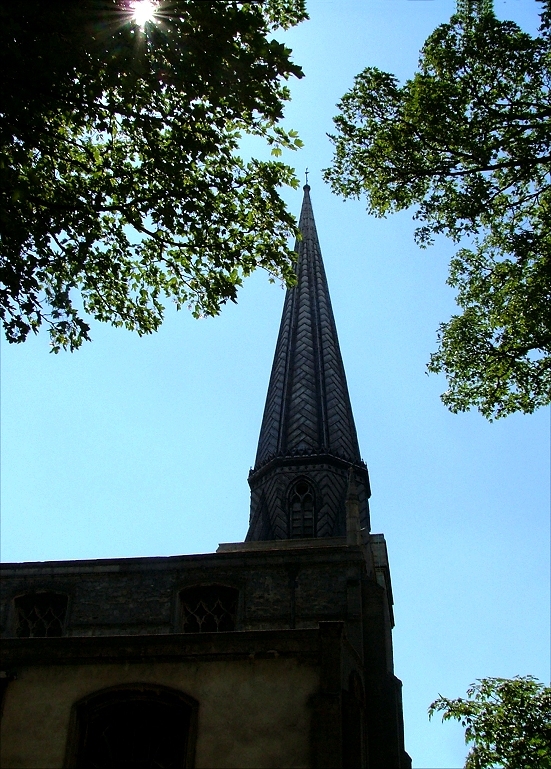 It sits in its peaceful, tree-lined setting, lifting George Gilbert Scott's 19th century spire above quiet yards, inns, banks, hotels and the jaunty Corn Exchange. 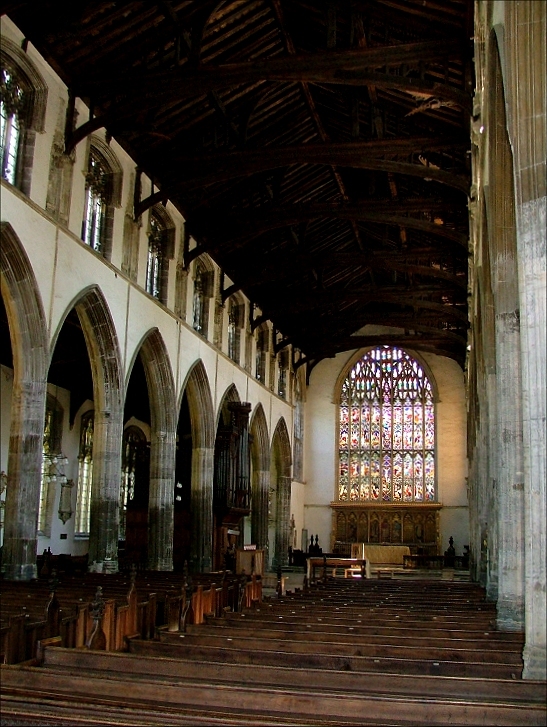 This vast hall of a church, some 200 feet long, was, incredibly, built as a chapel of ease to St Margaret, and even today is styled 'St Nicholas Chapel'. 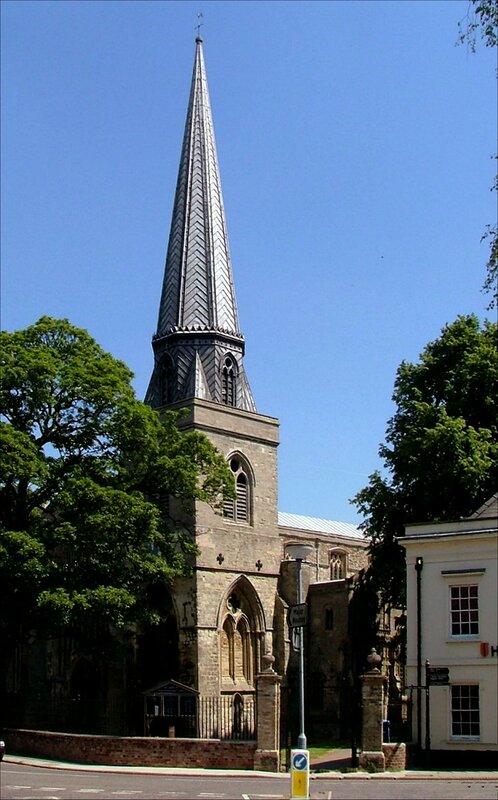 If you exclude Cambridge's Parker's Piece, which is surely too big to be considered, then the Tuesday Market in Kings Lynn is East Anglia's largest urban square, a dreamy lozenge of 18th and 19th century architecture. It surprises me that it is not better known, although the tourist industry is really beginning to gear up in Lynn. This is partly because it is a designated area of deprivation, its old industries struggling to employ the people that they once did. Consequently, there is a smell of European money, the whole town is undergoing a face-lift, and the museums are of the highest quality. And, it must be said, the people are really very friendly indeed, as if they appreciate your interest. Everywhere, in museums, shops and pubs, people go out of their way to help you. If you are fed up with being treated like dirt by the tourist industry in Cambridge, come forty miles north and spend your money here instead. True's Yard, the museum of the fishing industry, sits just to the north of St Nicholas, and it is here that you collect the key. 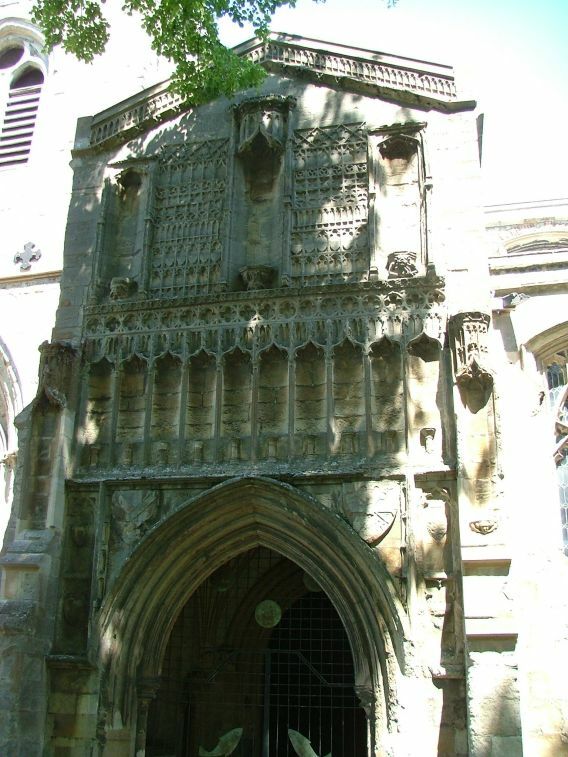 It is worth noting that St Nicholas has been redundant these last thirty years, and is in the care of the Churches Conservation Trust. Because of this, it is often in use for concerts and performances, and it is really worth ringing up the museum first to ask if access is possible before visiting. They prefer not to give out the key if the church is full of musical instruments or electronic equipment. But the museum workers are as friendly as everyone else, and clearly know and love the church well. To start, then, at the west end, that mighty clear window lording it over the narrow street. 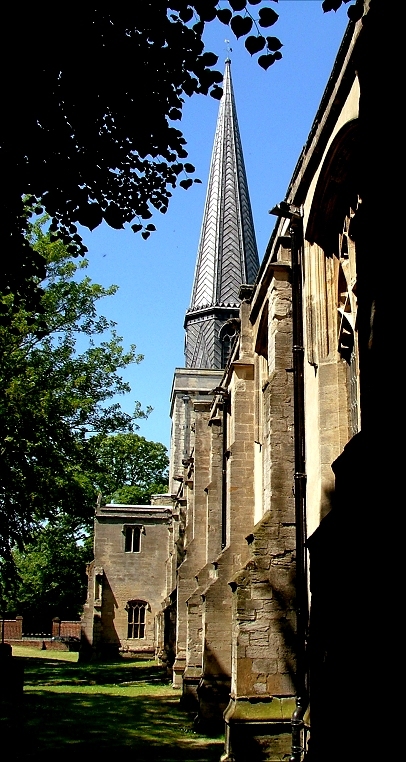 The tower, once you take Scott's spire out of the equation, is curiously small, its Early English tracery out of kilter with the rest of the building. 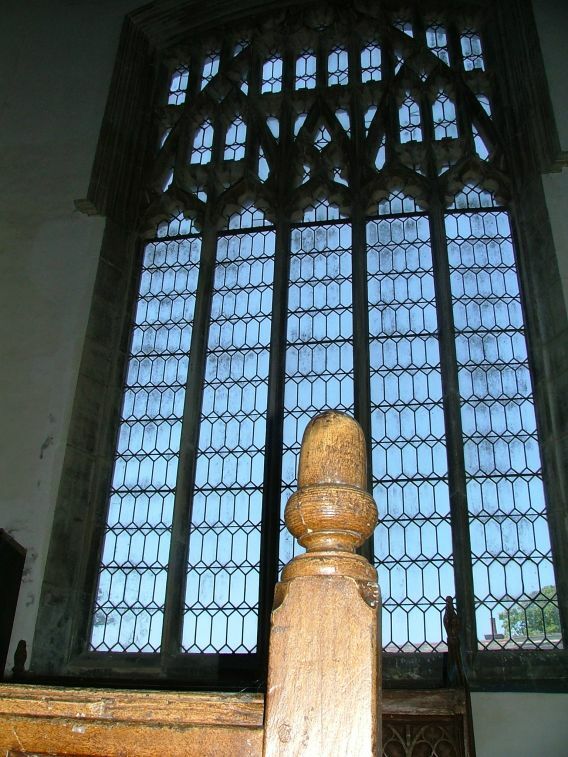 There are echoes of Cley, and for the same reason; the tower is a survival of a much earlier, smaller building. 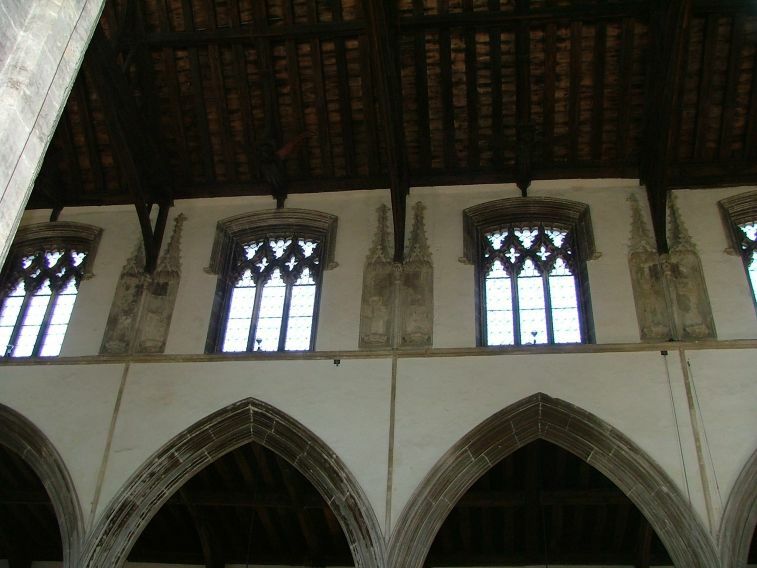 And yet, as at Cley, there doesn't seem to have been any intention to rebuild it before the Reformation intervened. 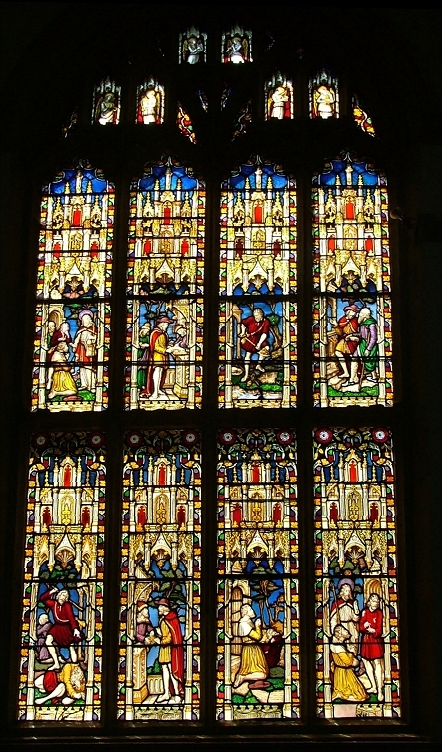 By the 15th century, the clear rational light that a vast window could provide seems to have been a higher priority than the height of a tower to proclaim the glory of God. 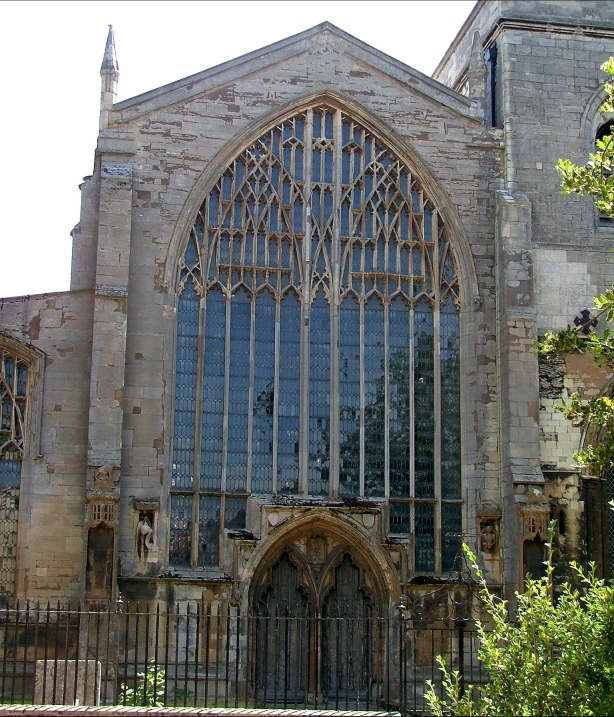 A friend, knowing nothing at all about churches or church history, had recently told me that she'd visited Kings Lynn and bought some plants from a stall 'near the Cathedral'. 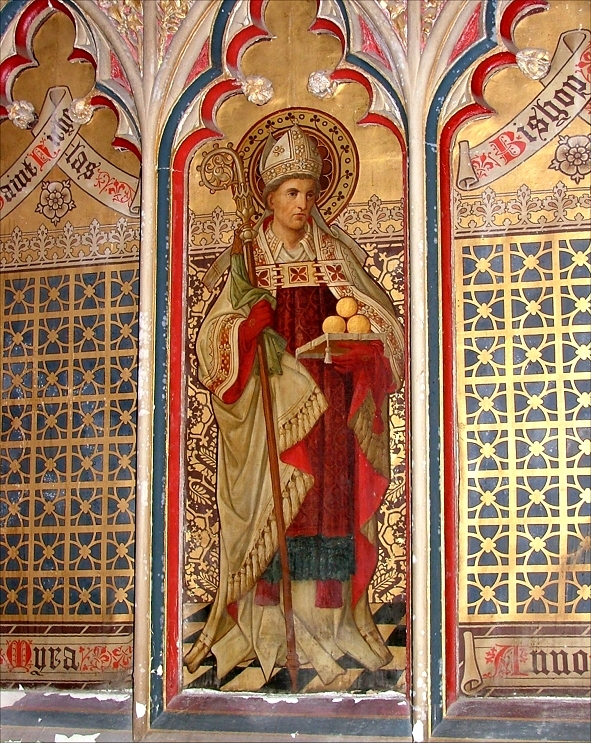 She meant St Margaret, of course; nobody could possibly mistake St Nicholas for a cathedral. 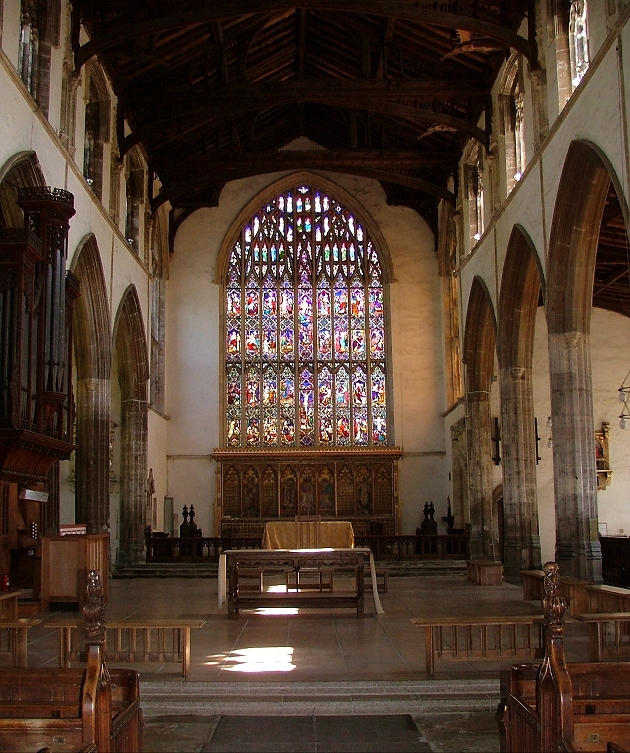 And yet, even though it is not as long as St Margaret, it is in many ways more spectacular, and certainly grander. 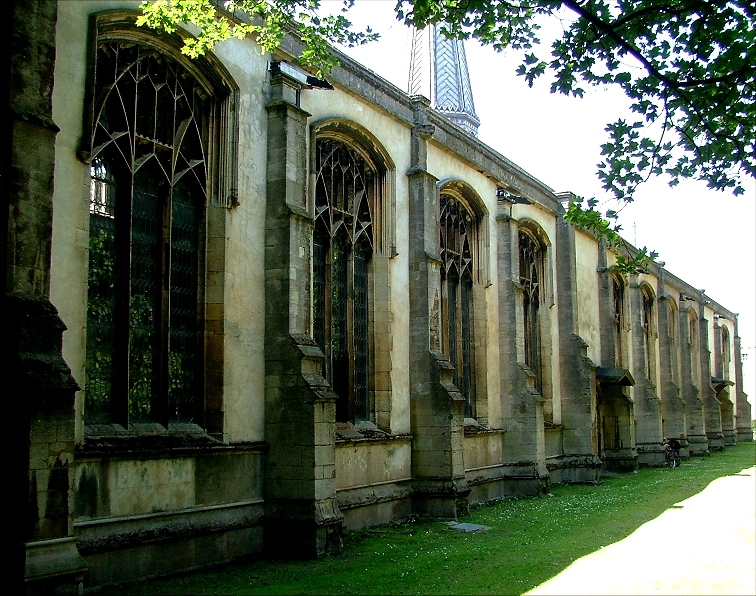 The rebuilding of St Nicholas as a huge Perpendicular hall church happened surprisingly early; in a bequest of 1419 it is already being referred to, as de novo edificato ('newly built'), which makes it increasingly certain that no new tower was planned. 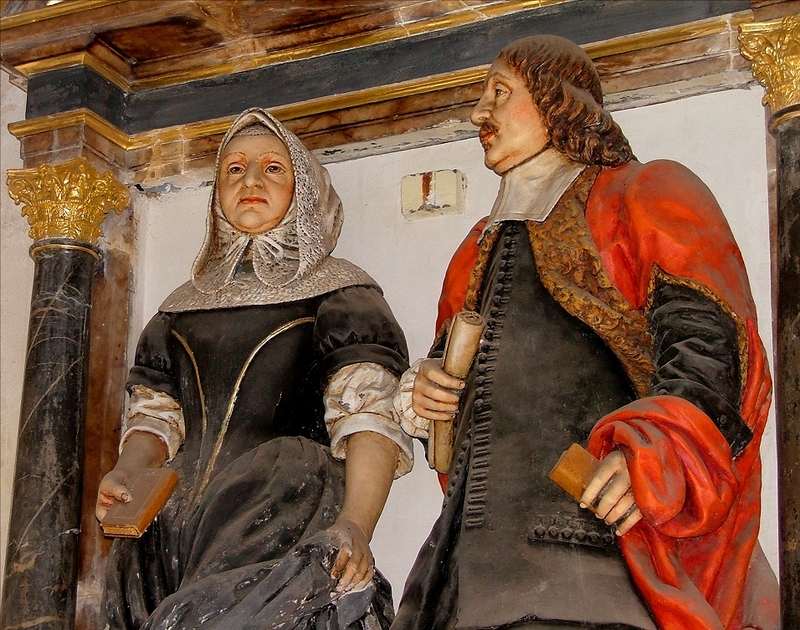 The tower itself must be two hundred years older, and the only surviving traces of the church that predated it are on its eastern face inside the church. 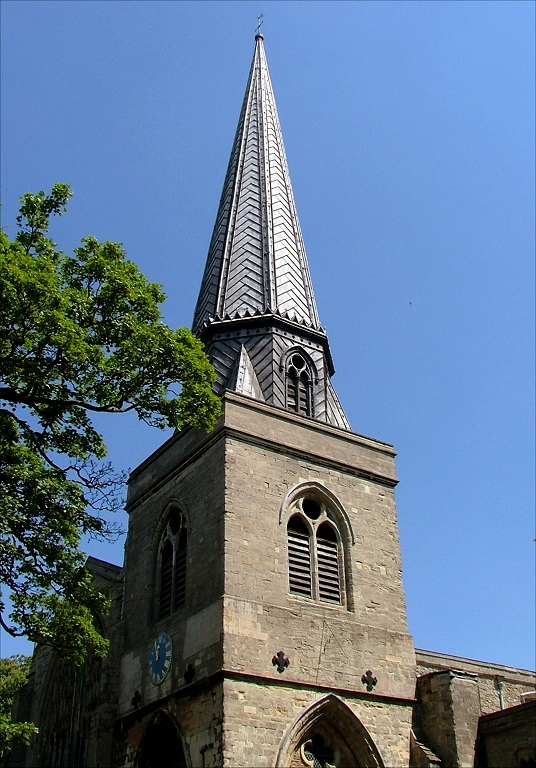 The materials are stone and red brick, but otherwise the church is strongly reminiscent of other large 'single-build' Perpendicular churches from later in the century like Lavenham, Southwold and Bury St Mary. 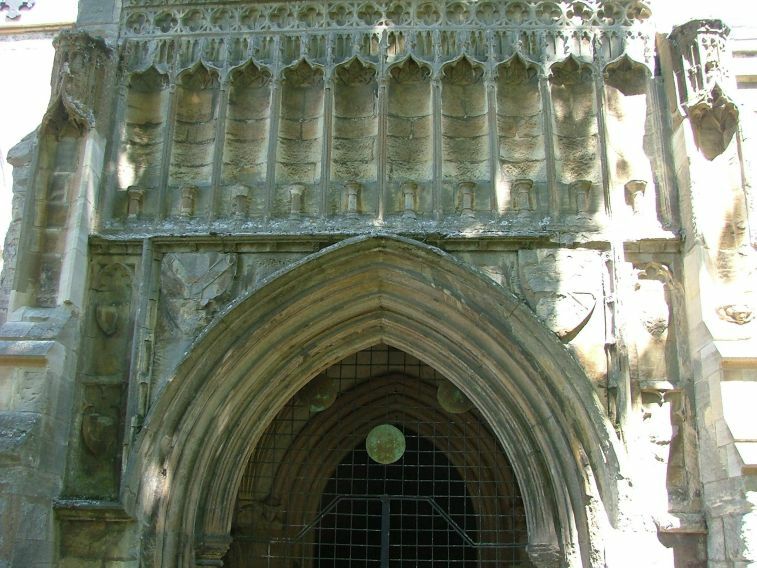 To complete the Suffolk motif, there is a spectacular two-storey porch on the south side, which I am told is stone-vaulted with bosses, but it is the only part of the building which is inaccessible. And so, you step in to a vast, open, echoing space, the aisles running the full length of the building. If you enter through the priest door, it is worth stopping in the aisle and looking west, and reminding yourself that you stand roughly on the spot where the high altar stood in the earlier church. 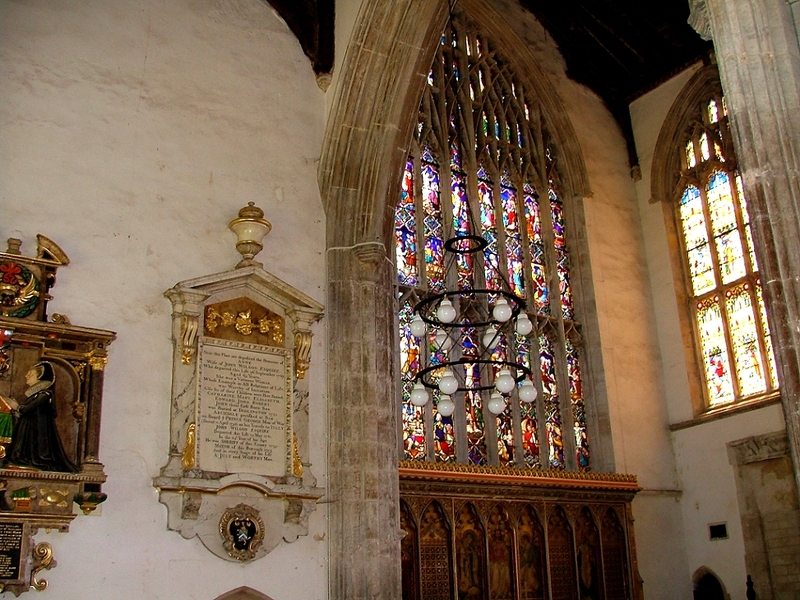 This is one of the biggest of the churches in the care of the Churches Conservation Trust. 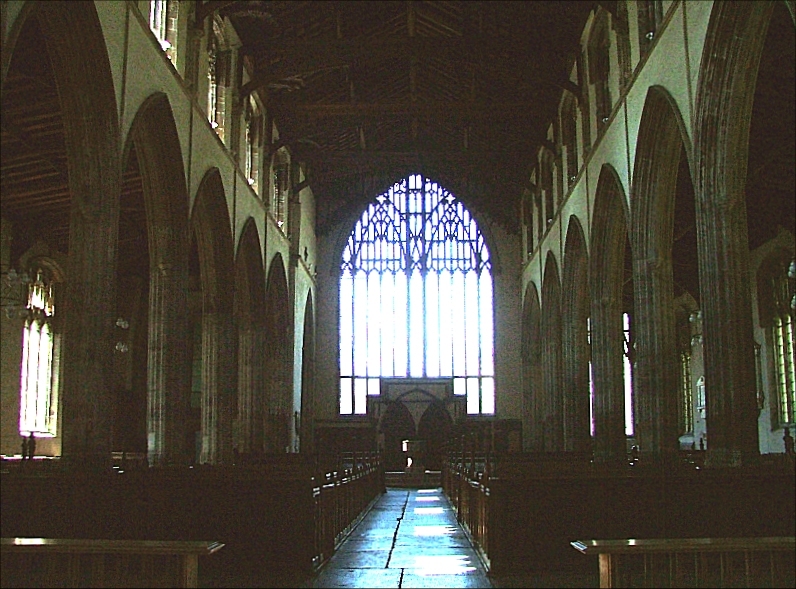 Of their churches in East Anglia, only Bungay St Mary begins to approach it in size. Churches this big don't respond to the CCT aesthetic as much as smaller ones; the clearing of clutter and stripping away of 20th century compromises which creates such a sense of quiet spirituality in a small church can leave a big one looking rather empty and sterile. 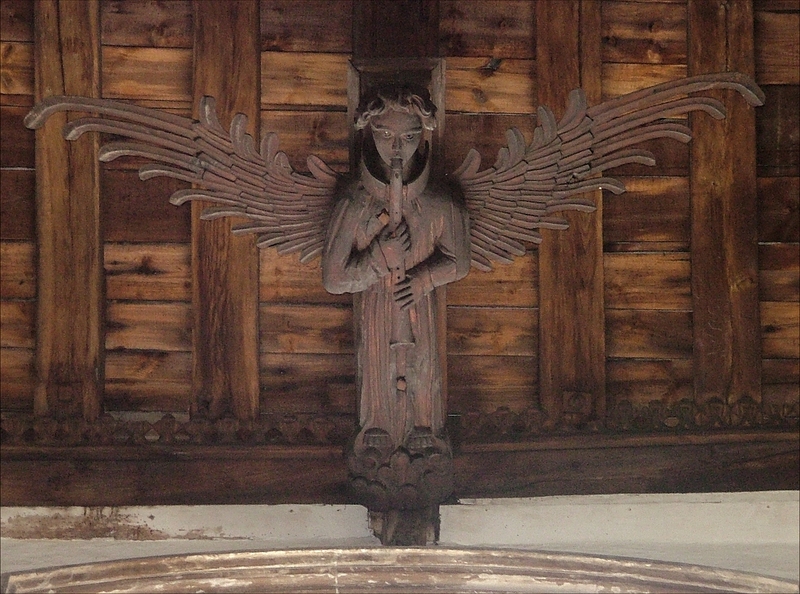 But St Nicholas is more than an architectural wonder, because there are some fascinating details to ponder. 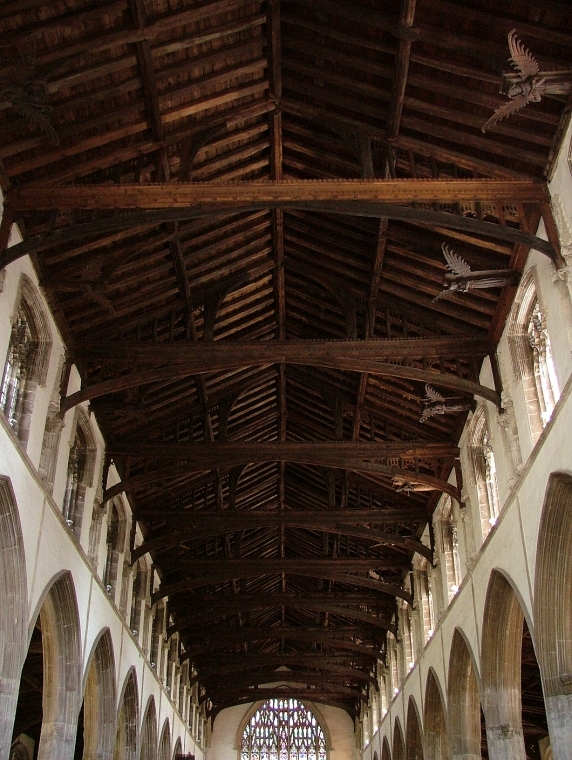 And so, you step through the arcade into the body of the nave, and the true magnificence of the building reveals itself, under a glorious late medieval angel roof. Before exploring you probably need to get over the great weakness of the interior. This is the vast acreage of mediocre 19th century pews, shoehorned under the arcades during John Brown's 1850s restoration. They are heavy and dull, a poor thing compared with the great roof overhead. I suppose that there must be some historical or financial reason for keeping them, but how good it would look if they could be removed and replaced with modern chairs, perhaps leaving the aisles empty. 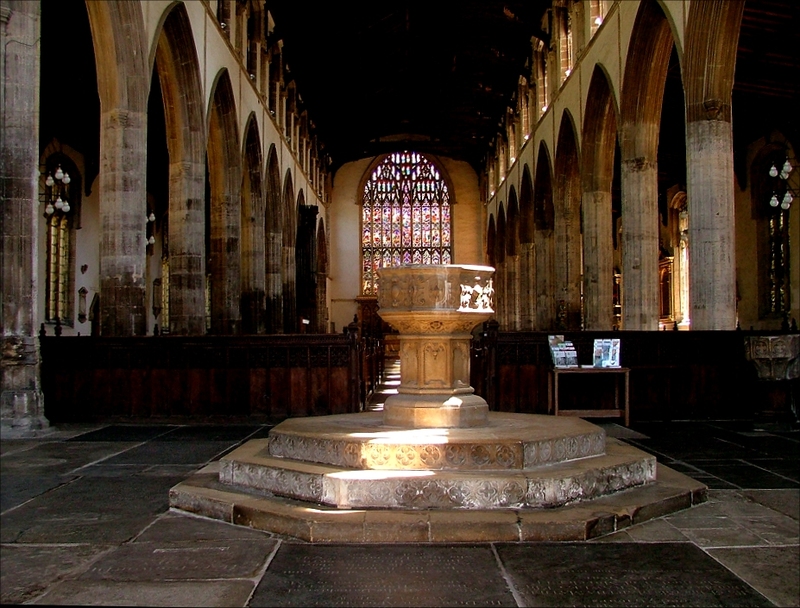 You walk through them to encounter one of Norfolk's more surprising fonts. 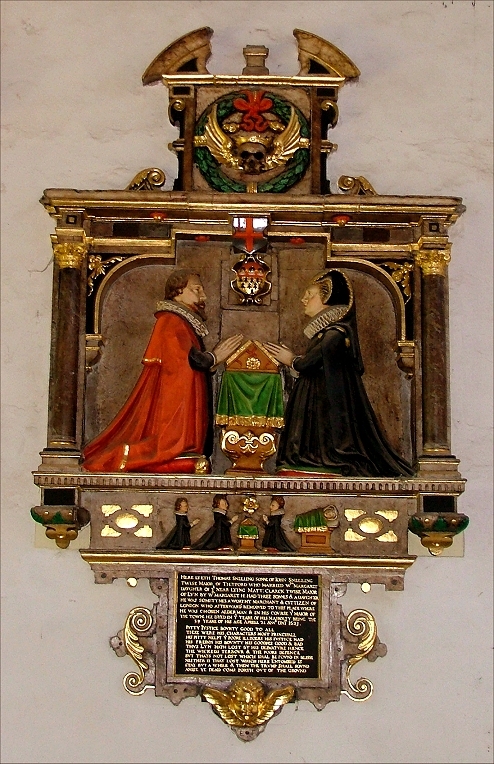 It is on a built up set of octagons panelled with flushwork, is decorated with strapwork, and bears the date 1627. There are several local fonts of about this date - Gaywood and Tilney All Saints spring to mind - but this one is singular because it may well have been the first font this building ever had. 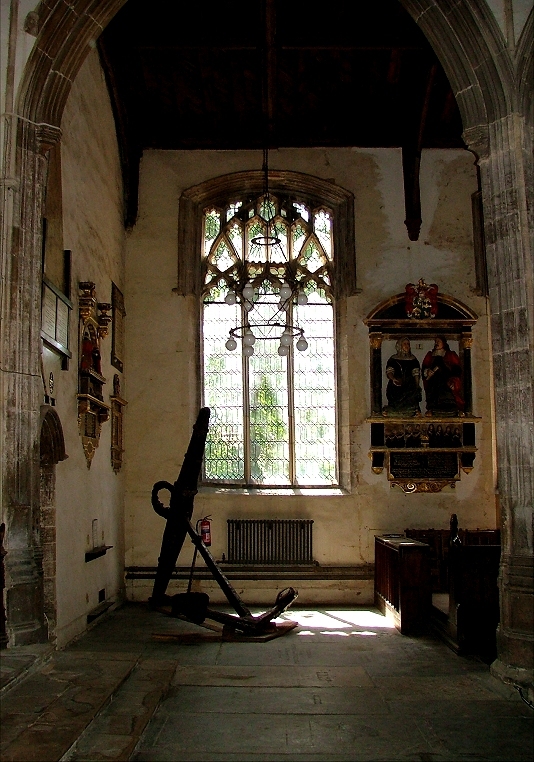 St Nicholas was granted a licence to perform baptisms as early as the 1370s, but it appears that it did not do so, and instead they were carried out in the mother church, St Margaret. 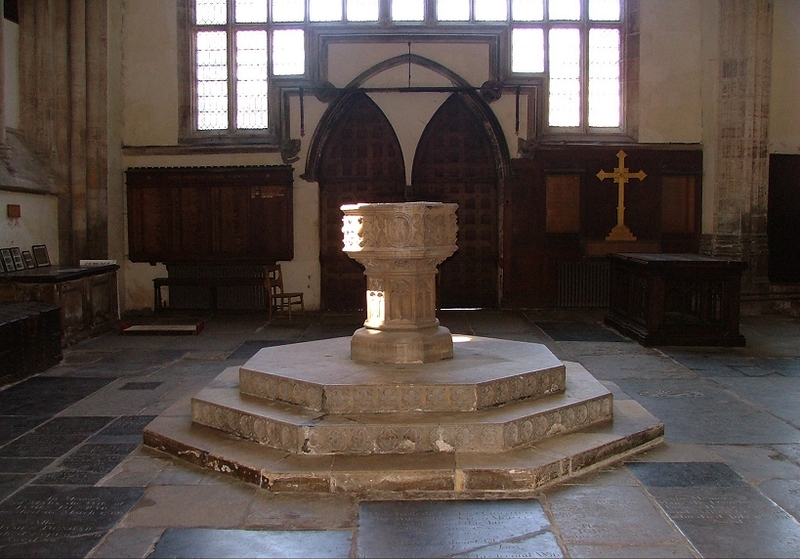 In the 1620s, Bishop Harsant of Norwich donated the font, and the font records his gift in an inscription on the eastern face. 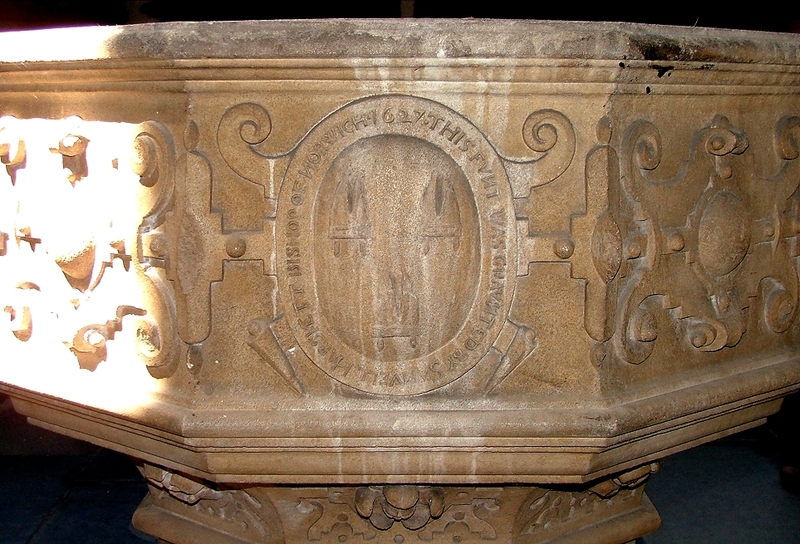 However, the pedestal appears contemporary with the rebuilding of the church two hundred years earlier, and so one must always have been intended. 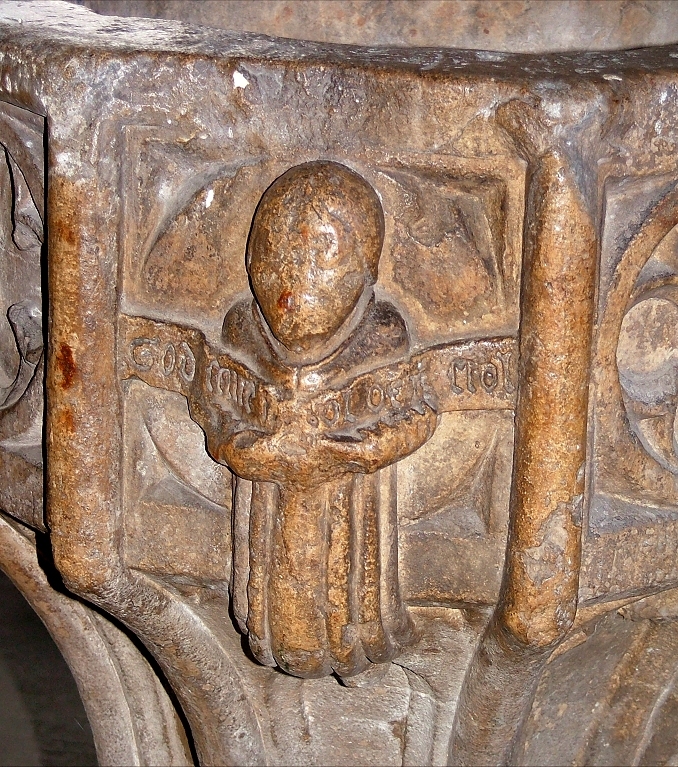 Nearby, there is what appears to be another, older font, set against a pillar in the south arcade. 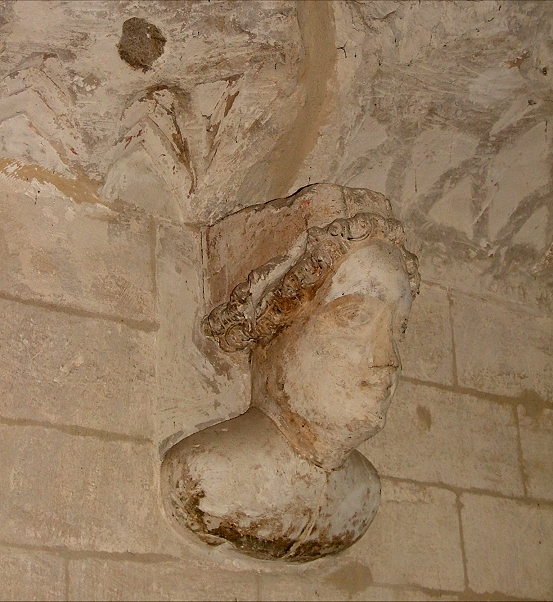 In fact, this is a holy water stoup, and was probably one of a pair that stood outside the west doors. If you look, the stone work has been angled to fit into a slot in a stone wall. 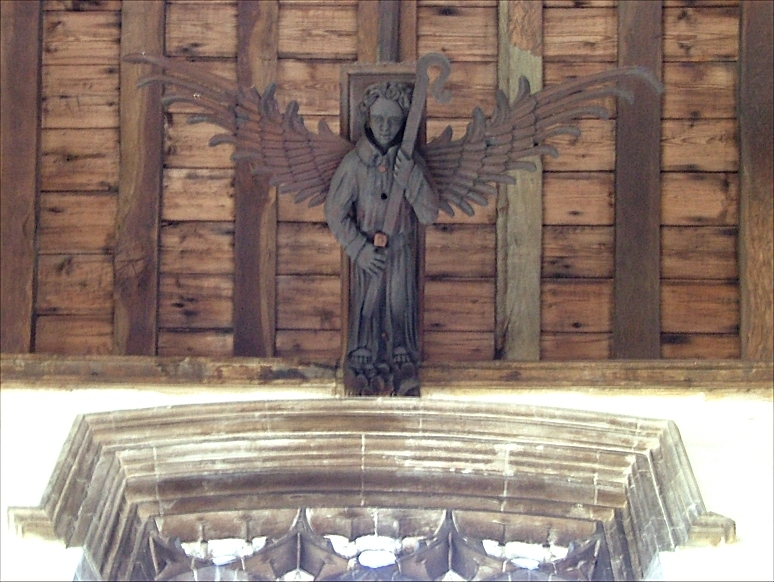 A fine, sombre angel holds an inscription on the opposite face. Curiously, we know a little about the first use of the Harsant font. 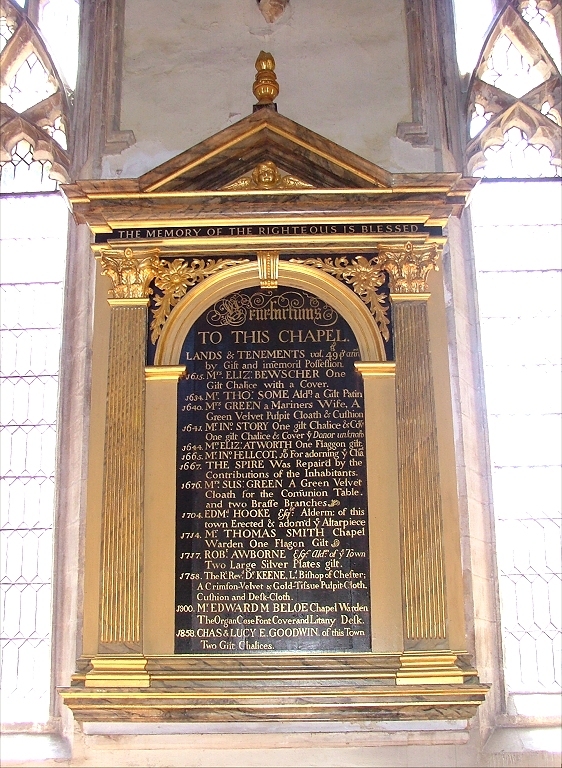 Up in the east end, there is a small, simple brass inscription set near to the north arcade. 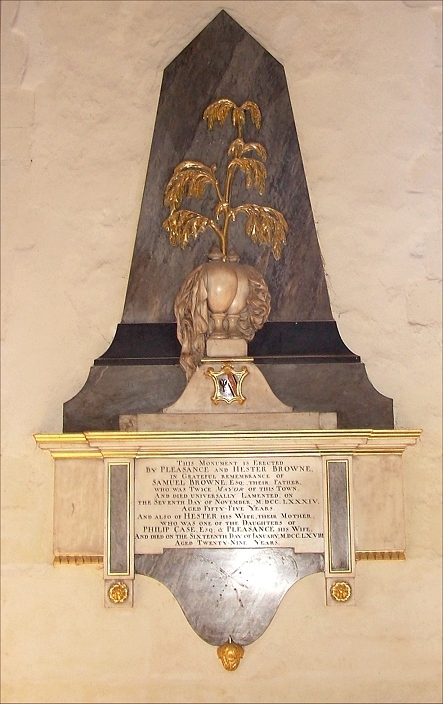 It reads: Here resteth Anne, daughter to Joseph and Isabel Raylie. 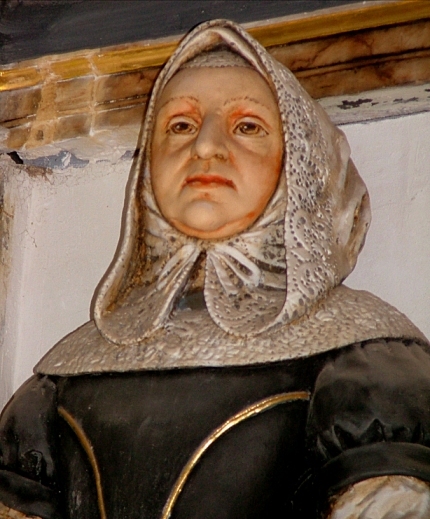 She was the first God gave unto her parents, and the first baptised in the Funt of this Chapell and died the 10th of March 1627 aged 24 dayes. 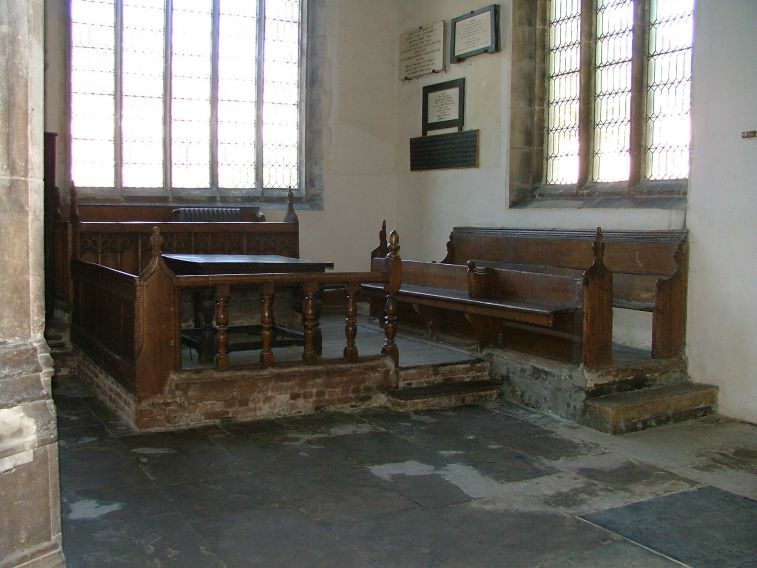 In the north-west corner, beyond the font, some benches have been cobbled together around a table. At first, this might appear like a modern attempt at some kind of meeting area, but it appears to have been put together much earlier, and was probably some kind of consistory court. 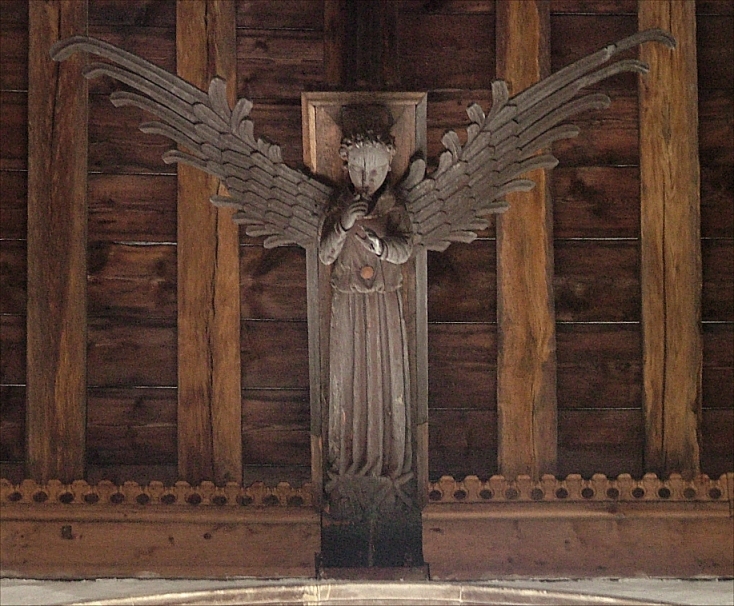 There is very little old woodwork remaining - some is here, some is in the east end of the south aisle, some in the sanctuary. 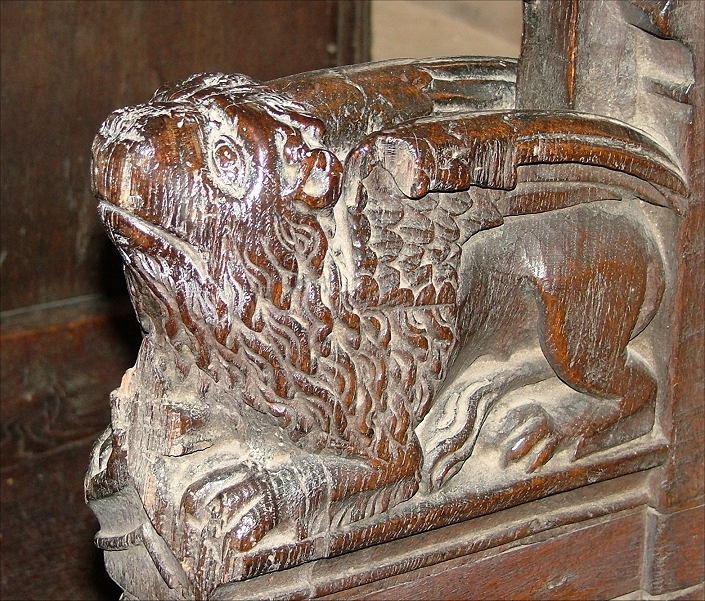 But in fact, there were some spectacular bench ends at St Nicholas, which for no accountable reason are now in storage at the Victoria and Albert museum in London. They should be returned here forthwith. 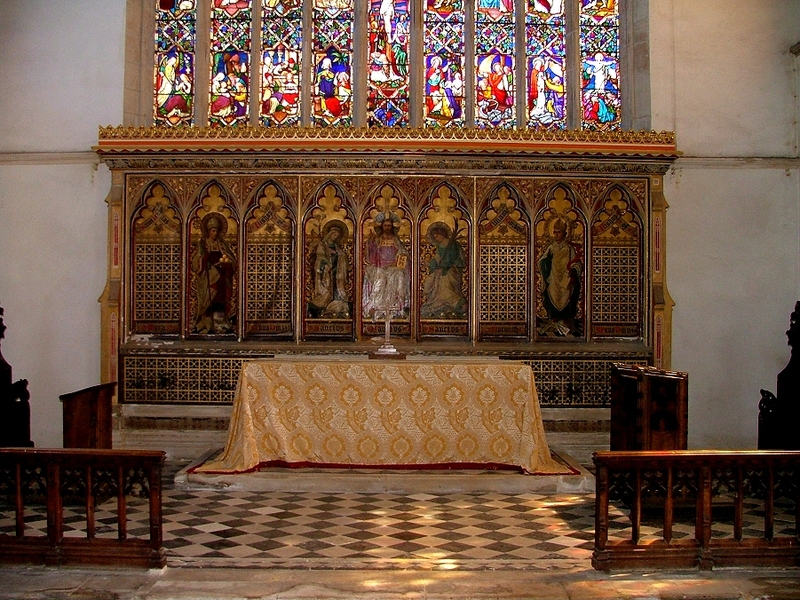 Turning east, the church has been redesigned beyond the benches for modern worship, with a nave altar. 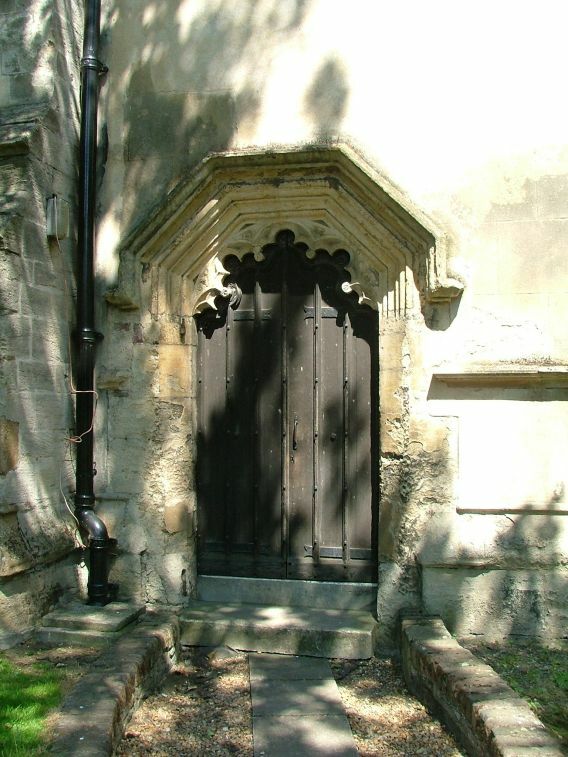 St Nicholas, as a redundant church in the care of the CCT, cannot perform the functions of a parish church. But, of course, it never did. 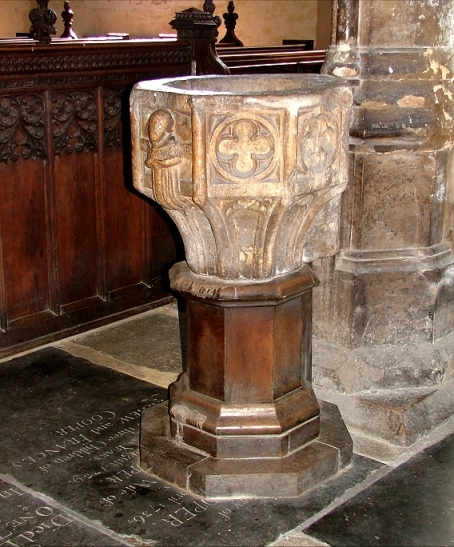 It is still used for occasional worship by both Anglicans and Catholics. 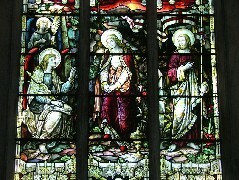 The sanctuary area is a sombre high Victorian affair, the work of Hardman & Co. 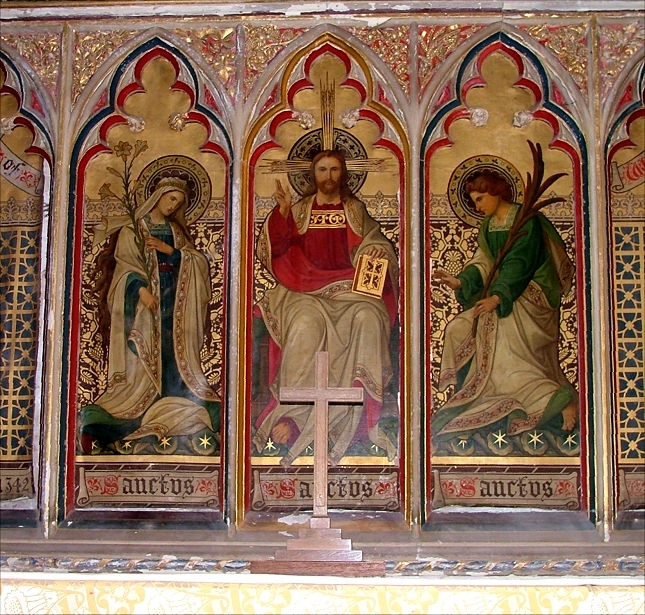 The figures are stilted; Christ in Majesty is flanked by the Blessed Virgin and St John, and on the far left a rather serious St Nicholas looks on. 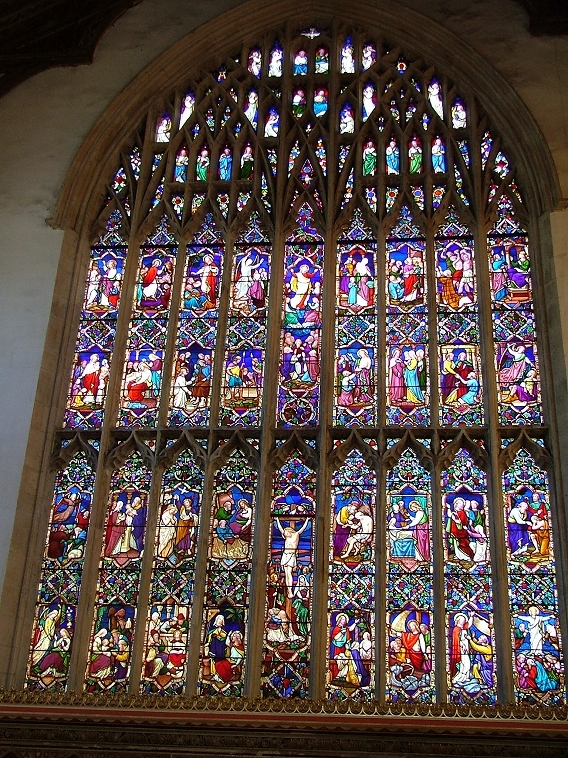 The east window above, by Ward and Hughes, is better. 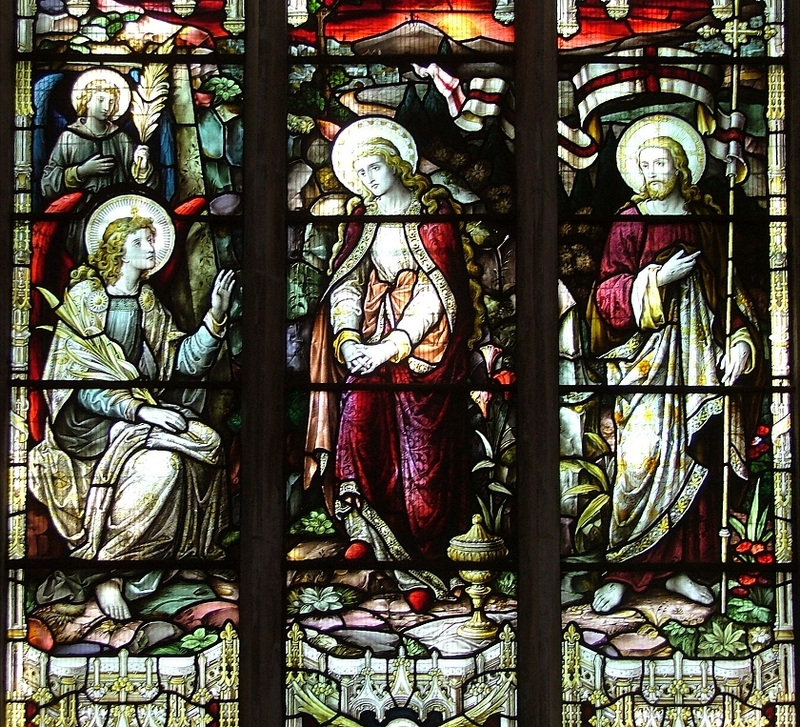 It depicts 32 scenes from the life of Christ, starting in the bottom left hand corner with the Annunciation and then weaving a wandering path around the huge expanse. 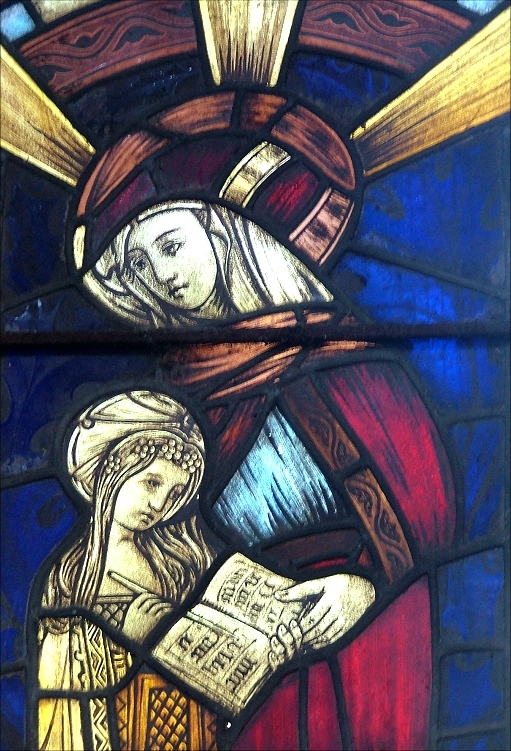 Elsewhere, there is a fine depiction of Mary of Magdala finding the empty tomb. 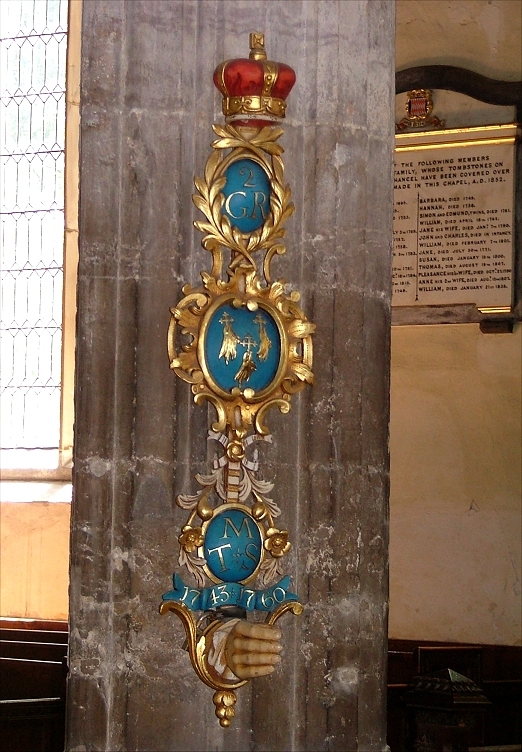 It is half way down the south aisle, including a little technicolour calvary towards the top, a curious touch. 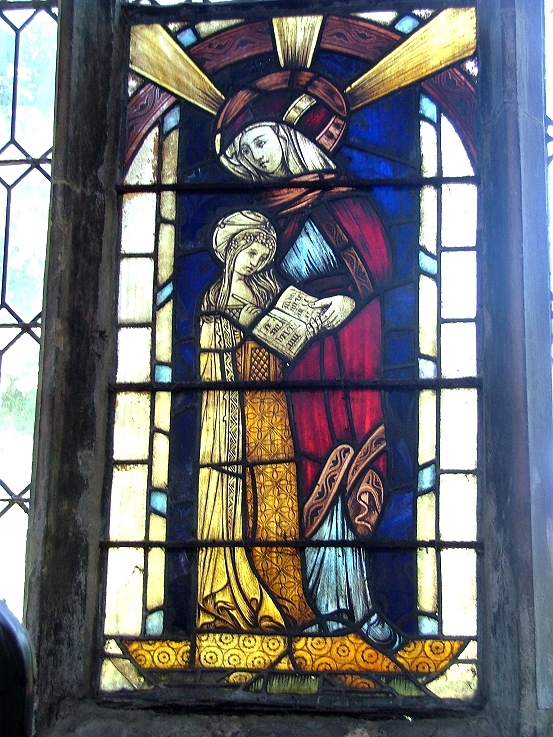 Perhaps the best glass here is an image of St Anne teaching the Virgin to read, in the north chancel aisle. This is always a tender scene, and particularly so here. 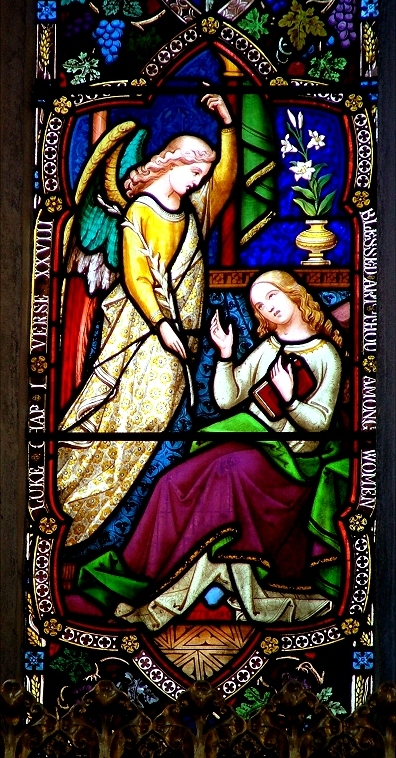 It looks very un-East Anglian, and David Moore, the verger, tells me that it is by the King workshop of Norwich, a copy of a panel in the church of All Saints in York. It has to be said that the King workshop copies are always a delight to find - perhaps the best is at Acle - even if they do sometimes make dating rather difficult. 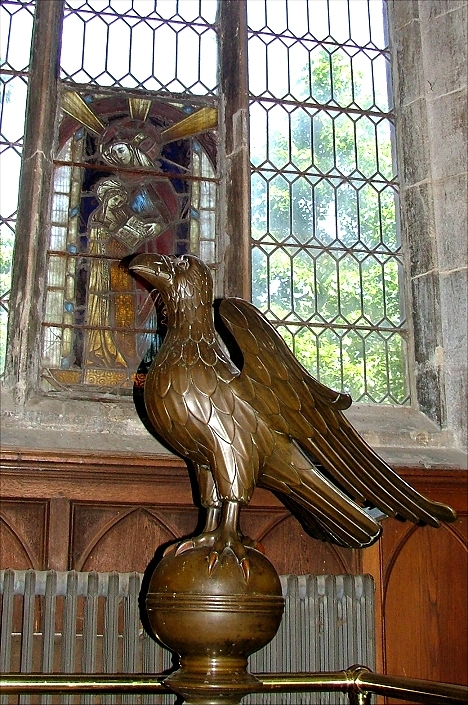 Bolted to the floor in front of the St Anne window is one of Norfolk's many medieval latten eagles. Most are highly polished, but as at Billingford the eagle here is left in its natural state. David Moore tells me that it is left uncleaned because it has a protective coating on it, which seems very sensible given that it is no longer in use. 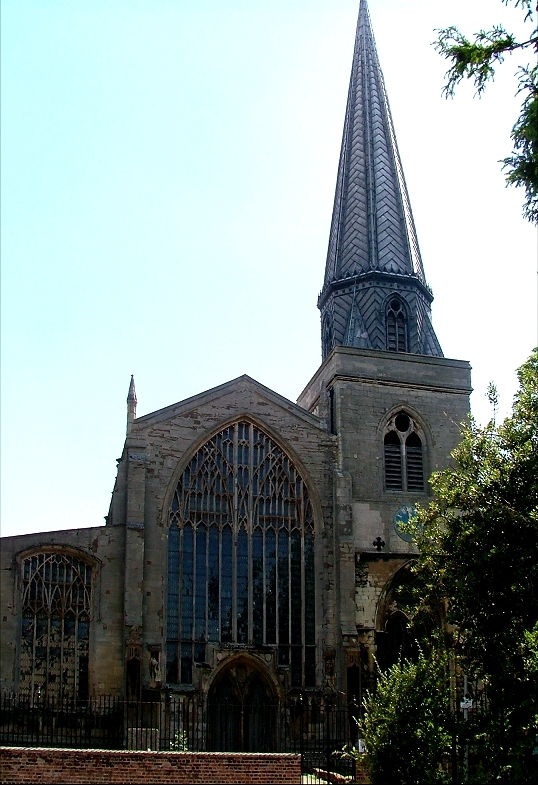 Pevsner says that it is almost identical to the one at St Mark in Venice. Striking in the vastness is the brightly coloured sword rest in the south arcade. 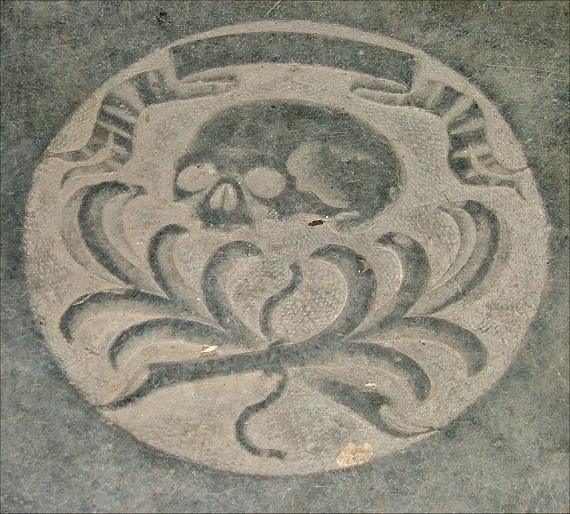 It is dated 1743, 1760. 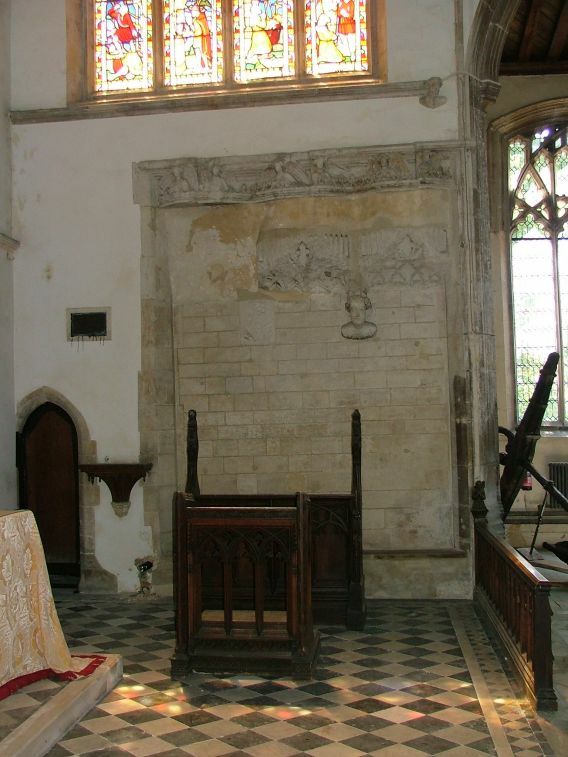 As I said, large CCT churches can sometimes appear rather bare, but St Nicholas is rescued from austerity by its wide range of memorials, probably the best collection in west Norfolk. 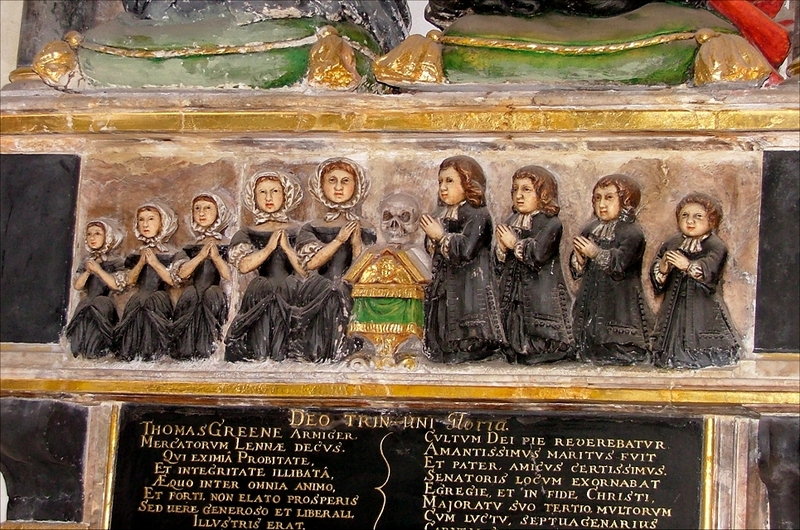 They are all very brightly coloured, the result of a restoration in the late 1970s. They are all worth a look. 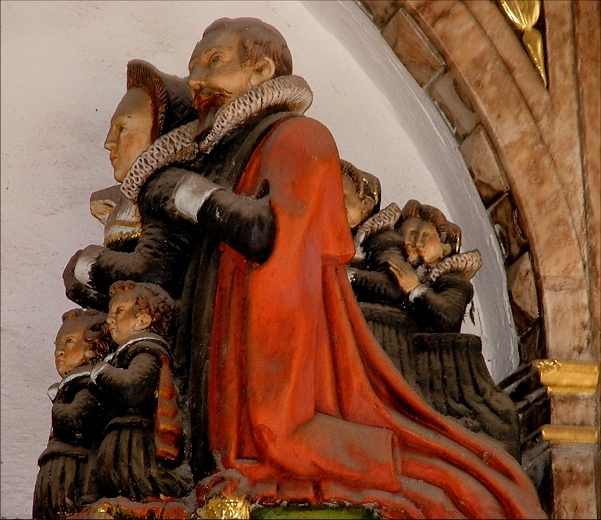 The 1620s Clarck father and son memorial on the east wall of the south aisle is very striking; it shows them either side with their wives, Matthew Clarck's side being delightfully crowded with nine children bustling around him and his wife. 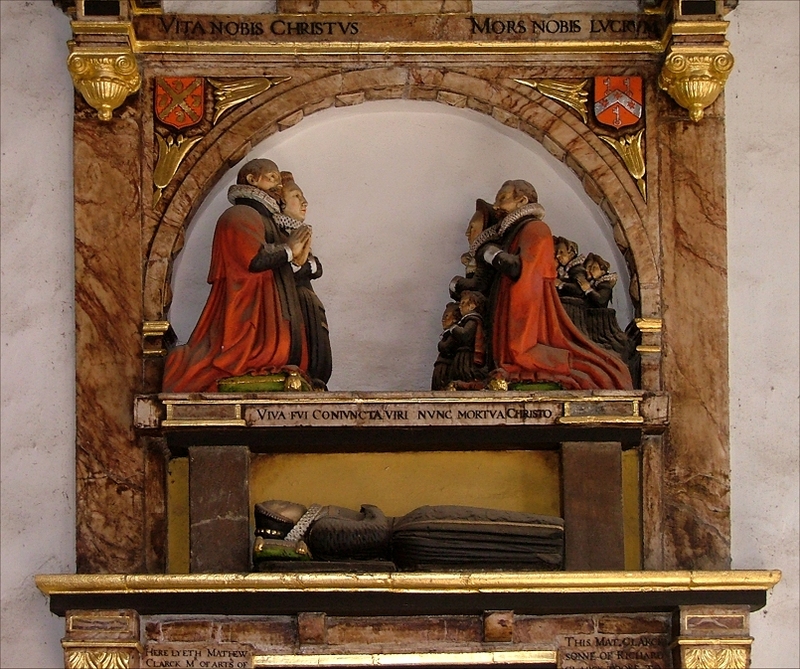 Beneath, the figure of his first wife sleeps, and across the top it says Vita Nobis Christus, Mors Nobis Lucrum ('Our life is in Christ, Death is our reward'). 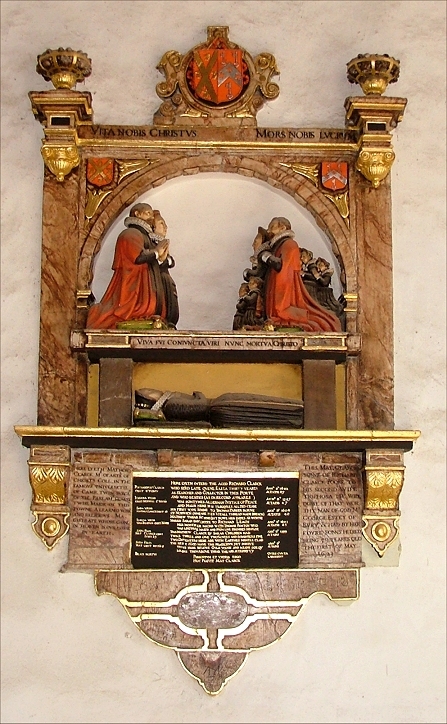 Across from this, and beyond the large ship's anchor which rests in this corner, is the even more striking memorial to Sir Thomas Greene and Susannah Barker his wife. 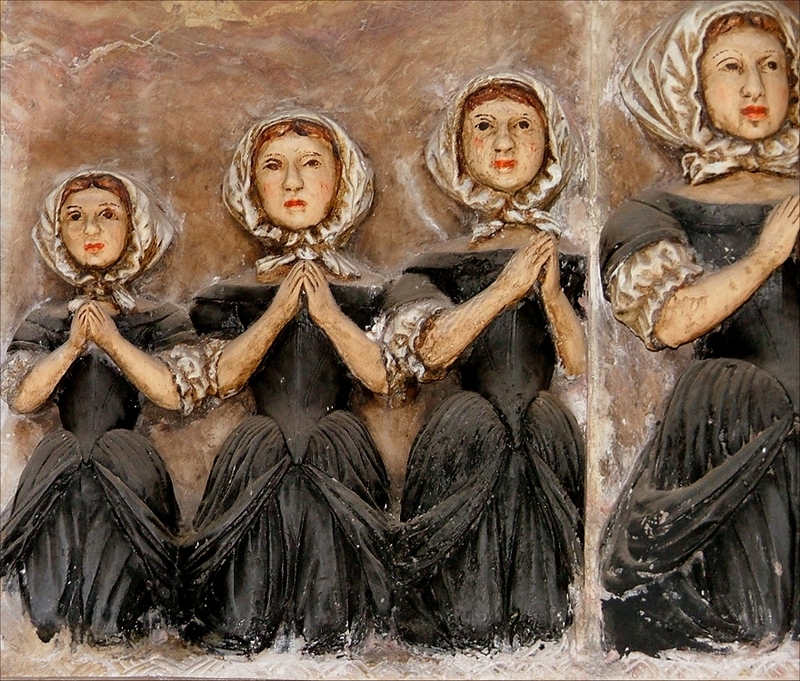 It dates from the other side of the Commonwealth, and they are shown in life-like effigy, warts and all. You can't help thinking that they would be recognisable to those who had known them. 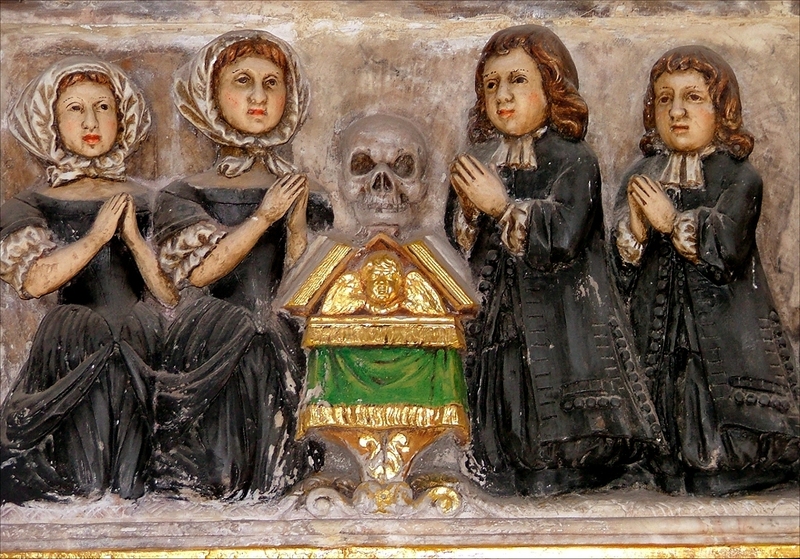 What makes the memorial so memorable though, is the array of their children beneath, who also appear modeled from the life, each with their own character, and to top it all, a grinning skull hovers over the prayer desk between them: Death, the uninvited guest. 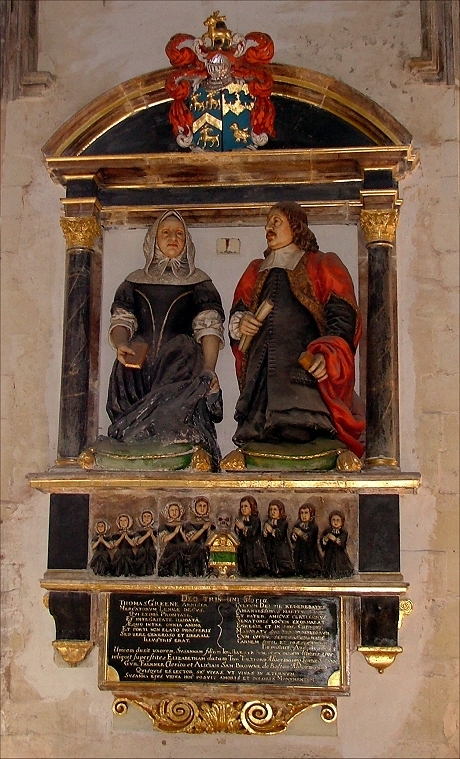 In the north aisle, Thomas Snelling and his Wife Margaret, facing each other across a prayer desk as if they were at breakfast, are positively restrained by comparison.